On a searing hot January summer’s day — one when the outback roads shimmer as though they’re wet — we rolled into Parkes in our boring white rental car, and quickly grasped the magnitude of our faux pas. We were not gel-haired, beehive-touting, diamanté-encrusted, jumpsuit clad, diehard Elvis fans. Staring down the barrel of Parkes’s main drag — jam-packed with some of the finest vintage cars we’d ever laid eyes on — we also immediately gauged that we shouldn’t have brought a Kia to the party. Every being in eyesight (dogs included), dressed to the nines in Elvis and Priscilla ensembles, was either dancing, swinging, clapping or singing as they walked. At the very least, they mosied. Elvis hits blared out of every pub, café, restaurant, Bowls Club and RSL, and a mass of possessed bodies could be seen in gyrating motion beyond the many Elvis bouncers. We hid the Kia, grabbed our bags and scurried as quickly as we could into our hotel room at the newly renovated Astro Dish Motor Inn, hoping that no one had spotted us in jeans and T-shirts. Couples and carloads of revellers continued to cruise into the hotel’s carpark — lounging back in their roomy Cadillacs with the windows rolled down, Elvis on shuffle. We closed the blinds and slipped into our sparkling spandex jumpsuits. It was now or never. 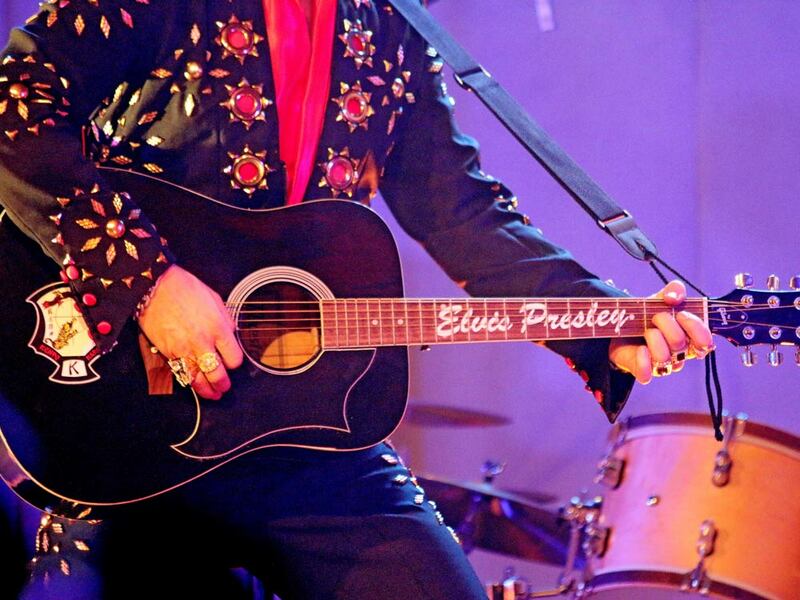 Every year Parkes Elvis Festival continues to grow, and it’s already the largest honouring Elvis outside of the USA. In 2018, more than 25,000 Elvis fans hit the streets for five days packed with live music, special events, talks, markets, pop-up stores and more, all in celebration of The King. The event also attracts stars from around the world, and this year saw model and author Tara Moss, former Olympic swimmer Lisa Curry and rock legend Phil Emmanuel get their blue suede shoes in gear. To highlight the serious nature of this event on the Australian calendar, there are now dedicated express trains — The Elvis Express and Blue Suede Express — from Sydney to Parkes, and this year Rex put on a Rex Hound Dog Express from Sydney, Parkes livery and all. Every seat was booked out, and thousands of locals came to greet the trains as they pulled into the town’s main station. We attended so many events and shows — the Northparkes Mines Street Parade (think Mardi Gras meets Elvis) and Sunday’s Elvis Gospel Service, followed by a Renewal of Vows Ceremony in Cooke Park. Turns out hundreds of Australians wanted to get married again dressed as the Presleys. We also fitted in visiting one of Parkes’s other main tourist attractions: the 64m-wide radio telescope called The Dish, where you can learn about its purpose, the people involved in its construction, the ongoing maintenance and its important place in history. The centre has fascinating displays, hands-on exhibits and a 3D theatre with shows, all focused on space and astronomy. Most people know The Dish from the Australian comedy-drama based on the true story of how Parkes Observatory was used to relay the live broadcast of man’s first steps on the moon during the Apollo 11 mission 1969. Parkes was called Bushmans prior to 1873, after a local man who owned most of the mine leases during the gold rush. Then it was renamed Parkes after Sir Henry Parkes, a colonial politician often referred to as the “Father of Federation” because he rallied behind the federation of Australia’s six colonies, and didn’t support British convict transportation. He was also instrumental in the creation of Australia’s continental rail network. To get a good grasp on the city, we jumped aboard an aptly glittering red four-seater trike manned by the owner of Trike Adventures, Peter, for a cruise through the Elvis-flooded streets up to the best place to get the lay of the land: Memorial Hill Lookout. The well-groomed hilltop, with its 33m-high tower, commemorates those from the district who have been killed in action during wars in which Australia was involved. Way down below us in Parkes we could make out thousands of glittering specs of colour jiving away in the distance. After a fabulous five days looking through a lens focused on the King of Rock ’n’ Roll, we were different people. We knew which cars Elvis had loved and collected, we knew all about his everlasting love affair with Priscilla. We read and heard endless tales about the tribulations and triumphs that gave Elvis the ups and downs that ultimately ended his life in 1977, when he was only 42. We most definitely knew most of his songs by heart, and that's not a good thing when you can't sing. On our final day, we approached our Kia in more appropriate garb than we’d arrived in — me in a silk, full-skirted ’60s swing dress with white and pale blue stripes and pink flamingos decorating its hem so that when I twirled they went around like a carousel. My partner was dressed in a ’70s red, brown and orange patchwork suede three-piece suit (perfect for the hot weather), his black hair coiffed in a quiff. We both wore gold-rimmed sunglasses. As we mosied through the carpark another couple strode confidently towards us — they could have been Elvis and Priscilla. Elvis nodded and grinned. We smiled back. “Nice outfits,” he drawled, Elvis-style. Well, I’ll be! The writer was a guest of Destination NSW and Parkes Shire Council. The Station Restaurant and Cafe in the Station Motel (offering lovely, modern accommodation) is a great place for a more high-end meal and drink, or a casual dining experience with the whole family. Don't pass through town without seeing 'The Dish', at the CSIRO Parkes Radio Telescope. It's open seven days a week from 8.30am to 4.15pm.